The Mudd-Ox XL is the big brother of the Mudd-OX GT, offering additional driver and passenger space and increased stowage capacity. It is powered by the Kubota 45 HP liquid cooled turbo diesel engine. The powerful and robust hydrostatic drive system delivers the ultimate in handling and safe control; precise control of power, drive and traction assuring exact positioning and manoeuvre even in the harshest of environments. There is no loss of traction or torque when steering and extremes of gradient are handled seamlessly; forwards or in reverse. 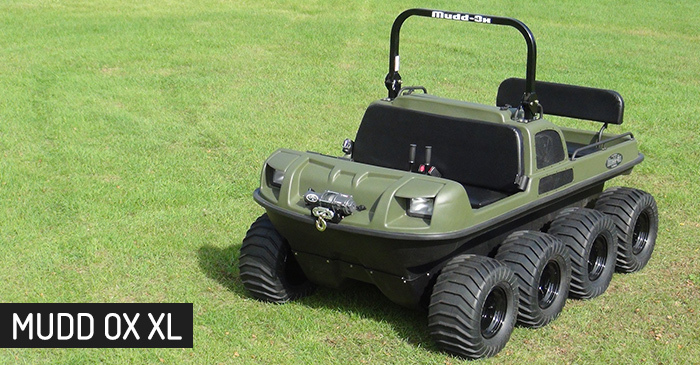 The Mudd-Ox XL has a zero turning radius, superior ride quality and is simple to control with usability features such as regulated engine speed and total control without the need for gear changes. The Kubota Turbo Diesel engine offers excellent power and torque at low revs with high reliability, providing economy and the ability to operate efficiently in extremes of conditions. 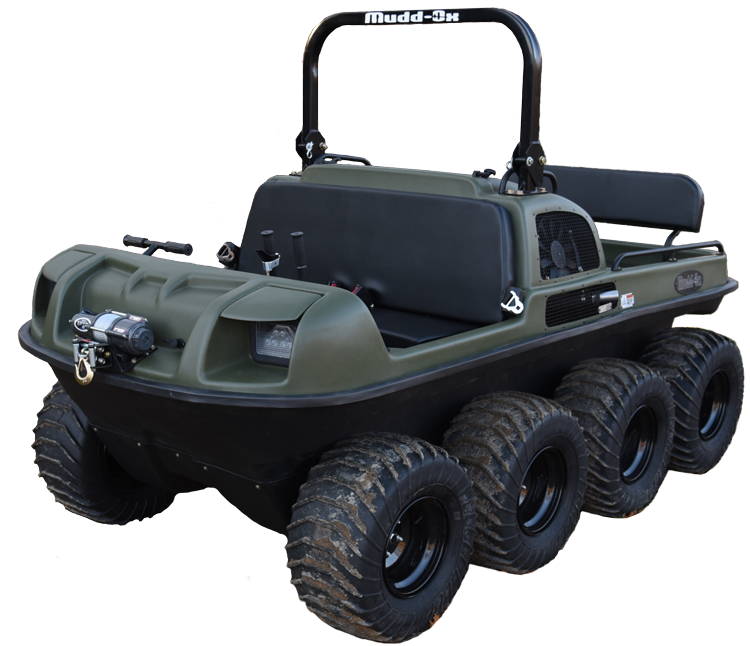 Standard: Amphibious capability, hydrostatic and hydraulic braking, 5,000 lbs (2,267 Kg) steel rope self-extraction or recovery winch (synthetic rope option available), Mudd-Ox Vendetta 26” x 14” x 12” tires on Mudd-Ox bead lock rims, fold-down front roll-bar protection system and seat belts designed for use on land and water, high/low headlights, tail-lights, bilge pump, electric start, tachometer, speedometer, fuel gauge, volt meter, water coolant temperature gauge, hydraulic oil temperature gauge, hour meter, 12V electrical output, USB charging outlet, lockable glove box, trailer hitch, steel powder coated chassis and an almost unbreakable high density polyethylene body, 2 year or 500 hours limited warranty and 2 year engine warranty.